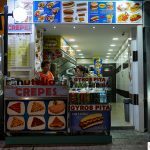 Hersonissos or Chersonissos is a bustling small town situated between Heraklion and Stalis on the eastern side of Crete. 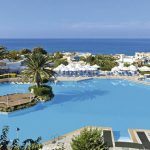 Not far from the airport Hersonissos offers something for couples and families and the young alike, thriving nightlife, small sandy beaches, excellent shopping, sightseeing boat trips and to the local golf course. The town is very cosmopolitan attracting a varied range of European tourists from Holland, Ireland, UK, Italy, Germany and Spain to name a few. 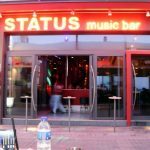 Like Stalis this is a town very popular with Irish & Dutch holidaymaker’s and you will find a wealth of Irish & Dutch bars and cafes. 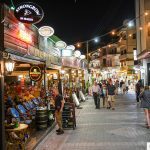 The main centre of is crammed with relaxing cafes and Taverna’s and the waterfront has different places to eat from traditional Greek Taverna’s to Italian restaurants. The beaches of Hersonissos wind around the town with lots of hidden coves to explore and quiet beaches. The beaches do get busy fast so get up early where you can or head down to Star Beach where they will always find you a sunbed. The beach most people visit is Star beach, here you can find a small water park, aptly named Star Beach Water Park, with a nice sandy beach at the front, water slides, live DJ, Go-karts and the famous bungee rocket. 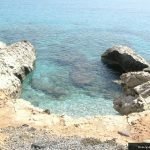 You can find smaller beaches and coves by heading towards the smaller town of Anissaras which sits towards Heraklion, its a short drive into Anissaras or you can walk the coastal paths into the area. 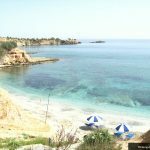 Here the beaches are less busy and more private, following the coastal path from Hersonissos will bring you upon a nudist beach also. Most of these beaches can be accessed by following the paths down from the main roads and the beaches you will find are a mix of sand and shingle. 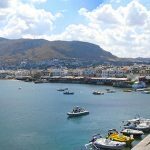 If you want to enjoy Crete from the sea you can book a day trip on a glass bottom boat to tour around Hersonissos, Stalis,Sissi and Malia, stopping off on a beach for a BBQ and to swim and snorkel. Hersonissos is also home to one of the few nudist beaches in Crete which lies to the west of Hersonissos. On of the best ways to enjoy Hersonissos and the surrounding areas is by going horse riding. There is a horse riding stable next to Star beach, called Gregory’s horses where they do horse riding around Hersonissos, Piskopiano and Lassithi Plateau. The owner Gregory will pick a horse to match your personality and take you on guided tours of your selected areas. The price for horse riding does vary but you can easily get a price list from the local travel agents or from the stables during the day. If this is not what your looking for you can enjoy browsing through the designer shops that sit on Hersonissos beachfront, take your pick from Diesel, Levi, Giorgio Armani and more. Prices of designer clothing is slightly cheaper than that of the UK so you should be able to pick up a bargain. During the day Hersonissos port is a nice place to relax and watch the world go by, with fresh fish landed daily you can enjoy some great meals during the day or in the evening at many of the Taverna’s at Hersonissos port. 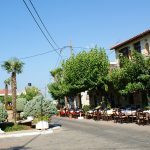 There are two main villages that border Hersonissos, the first is Piskopiano which sits on a hill above the holiday resort of Hersonissos, its a lot quieter than the main town, and has some lovely Greek restaurants and small intimate bars. 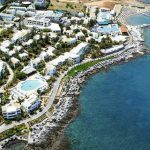 Within Piskopiano you can book hotels and apartments, and it only takes 20 or so minutes to walk back into the main area of Hersonissos and the beaches. 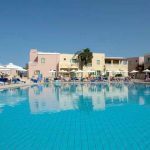 The village is ideal for older couples and families who don’t want to be in the thick of the action or sharing their hotel with younger groups of holiday makers. The second village is Koutouloufari which again sits just above Hersonissos, and is full of character and charm. 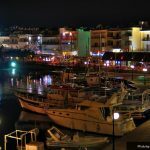 A lot of people choose to take their holidays in Koutouloufari to be close to the facilities that Hersonissos provides but to relax at night in the small Greek bars, cafes and Tavernas. For the best Greek food try the Four Seasons restaurant which is a firm favourite of many tourists. Restaurant Sergiani located in the central square of the gorgeous small and traditional village Koutouloufari, just 800 meters away from Hersonissos. Also Myrtios restaurant in Old Hersonissos is another. For waterfront restaurants try Marina Lounge restaurant or Knossos Beach Restaurant. The current number one restaurant in Hersonissos is Taverna Harakas which sits at number 1 on TripAdvisor. If you have a particular Hersonissos restaurant or Taverna that you liked, please think about leaving a review for other people to read and go and enjoy the wonderful food. 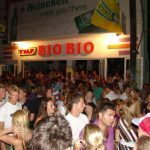 Hersonissos nightlife is quite varied, but consists mainly of clubs and pubs playing music into the early hours, the music of Hersonissos is mainly trance and dance music, with a little RnB thrown into the mix. 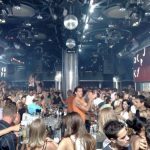 Some of the best places to go clubbing in Hersonissos are near the main waterfront with the likes of Camelot Club, Havana Club, Status Club, New York Beach Club, and Bio Bio Club. If you explore down the back alleys you will find some great Irish and Dutch bars, which stay open till the early hours. A lot of the Irish bars have live music playing most nights. The most popular Irish bars are Players Irish bar and the Shamrock pub. If this isn’t your thing try the Karaoke bars or move onto the main street and watch the world go by in a quiet bar like Fame Cafe or the saloon Bar & Cafe.